The entries on this page about the “tool pressure regulator knob stripped – broken model 0300841” have to do with the Kobalt line of air compressors, primarily. Folks continue to visit this page to see the existing questions and replies, and now, can add a question and a photo or a few photos using the form at the end of this page. Tool Pressure regulator knob stripped/broken model 0300841. The tool pressure knob is stripped or broken. When you try to increase tool pressure, the knob just spins. Can’t find a replacement anywhere. Clint you will have to remove the cover from the panel (I’ve uploaded a photo) and you should find that the regulator is a relatively standard mini-regulator that you can purchase in many locations. You’ll have to disassemble the discharge piping to get it off. 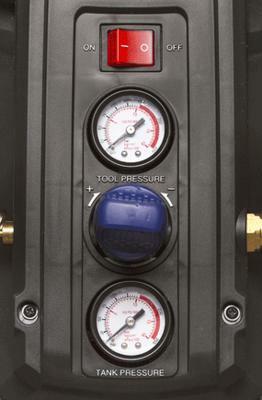 Expect that the new knob will look different but the regulator will work the same way. Make sure you install the regulator in the right direction. The arrow on the body points to the discharge coupler, not the tank. Yup, the cast manifolds are hard to find for some models. This links to the page on this site now about how to build your own using standard parts. I just ran into the same problem today. Does anyone have the model number or place where I can buy a new regulator that will fit in this assembly? HERE’S THE THING THOUGH. THEY ARE USELESS. YOU CAN’T FIND Anyone who sales them anywhere. I bought my compressor at LOWES. IT’S AN 8 GALLON 150 PSI HORIZONTAL AIR COMPRESSOR. P.O.S. WHY MAKE SOMETHING WITH THIS POORLY OF CRAFTSMANSHIP. WHILE IT WAS WORKING IT WAS GREAT. JUST TURNING THE KNOB SHOULDN’T BREAK IT. I have purchased 3 of these Kobalt 8 gallon air compressor’s. I don’t use them that frequently. Sometime I may go months before I use it. Two of the three units have had the regulator knob break and just spin. The first time I returned it to Lowe’s and they replaced it without questions because it’s their brand. Just last week I returned the second one and they refused to take it back and replace it. I am going to purchase a new knob and replace it. However, as I told the folks at Lowe’s, there is a Orange and White colored store just a 1/4 mile down the road that would love to have my business. Purchased a Husky brand from the Orange and White store on Sunday. I have been a Lowe’s loyalist for years but would not recommend buying this Kobalt brand of air compressor for the reasons I have shared.